Current and prospective HEBHBL service providers, please read the information provided below. An invitation to apply for funding through HEBHBL is now open and will close on Friday 31 August 2018 12pm WST. The aim of HEBHBL is to increase access to a range of health services including expanded primary health for Aboriginal and Torres Strait Islander children and youth (0-21 years) for the diagnosis, treatment and management of ear and hearing health. Funding is able to provide reimbursement for individual and/or multidisciplinary team travel, accommodation, meals, administration and facility fees. In exceptional circumstances private health professionals can apply for an absence from practice allowance and/or workforce support payment. Successful applicants will be issued a Service Provider Agreement for the period 1 January 2019 - 30 June 2022 and a Payment Schedule for the period 1 January 2019 - 30 June 2019 (to be reviewed annually). Current providers must reapply for services. For more information regarding eligible services, review the HEBHBL Fact Sheet and Service Delivery Standards. 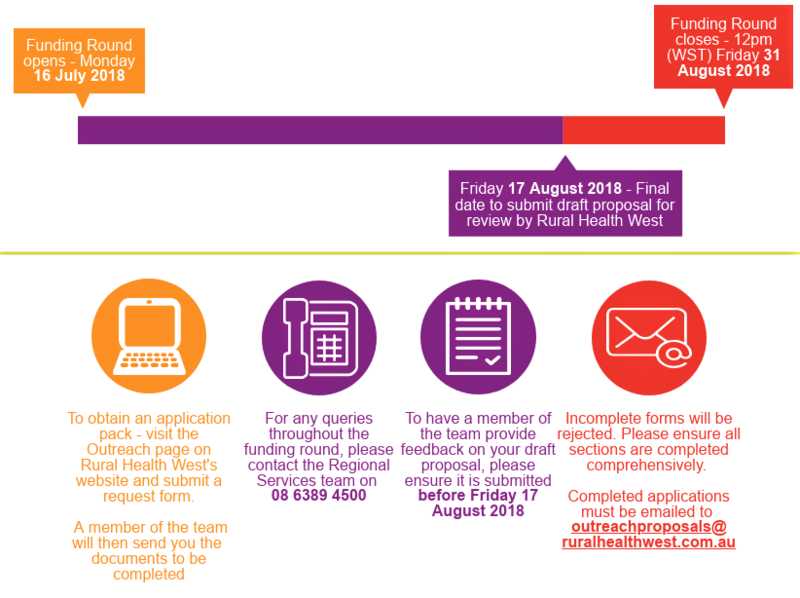 To apply for funds, providers must request an application pack through the Rural Health West website. A member of the Regional Services Team will then send applicants relevant documents including a Service Proposal Application Form for 1 January 2019 - 30 June 2022 and Itinerary and Budget Form for 1 January 2019 - 30 June 2019. Applicants are able to submit a draft proposal for feedback from the Regional Services Team prior to 17 August 2018. Final and complete proposals must be submitted before 12pm (WST) Friday 31 August 2018 for consideration. It is anticipated that the funding round will be highly competitive, we therefore encourage applicants to collaborate with local stakeholders and work with communities to develop robust applications. Service proposals with evidence of community consultation and letters of support from local stakeholders are considered to be strong proposals. If you have any queries regarding HEBHBL contact the Regional Services team via email or telephone 08 6389 4500. The Outreach programs are delivered by Rural Health West on behalf of the Australian Government Department of Health. This e-mail is for the intended recipient(s) only. If you have received this e-mail in error, please contact Rural Health West immediately. Before taking any action based upon advice and/or information contained in this email you should carefully consider the advice and information and obtain relevant independent advice.